Aniakchak is remote, wild, and has some seriously nasty weather. It is one of the least visited National Park areas. Aniakchak is Alaska's point in the volcanically active Ring of Fire. The monument is a six-mile wide, 2,000 ft. deep valley of sorts formed during a massive volcanic eruption. 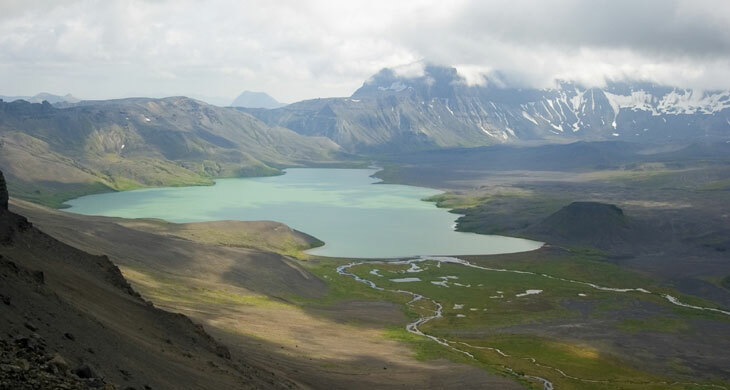 The Aniakchak Caldera is 6 miles wide and 2,000-foot-deep. It was created by the collapse of a 7,000-foot volcano. This picture shows Surprise Lake located within the valley. It is the source of the Aniakchak River and runs down from the here. Outdoor Activities There are no trails, campgrounds, or other facilities and many times of the year there are zero inhabitants of this area. If you come here be ready to create your own adventure. This is a dynamic, unpredictable truly wild place and nothing is ever the same twice. I think it is so dangerous here that it would not be an understatement to say you are risking life and limb to be here for an extended period of time. Do not go without more information than this little website that is for sure. Don't travel alone, in fact I don't recommend you Vanabode here at all. Camping There are no campgrounds in Aniakchak National Monument and Preserve; all camping is primitive. You are on your own and under these conditions you could conceivably have a truly top of the world over the top adventure behind anything you have ever lived. Permits are not needed within Aniakchak National Monument and Preserve. You should make others aware of your plans both at home and on the ground here in Alaska at the closest point to civilization. Leave No Trace is encouraged here just like every other great national park Outdoor ethics state that nobody should know you were here when you leave, simple, right? 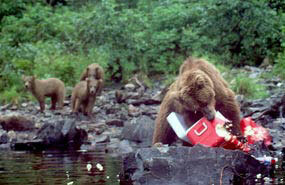 Image shows a bear completely destroying an unprotected cooler. They destroy anything in their path when they are ready to. There are some bear-resistant containers placed in the park but you must bring your own and hope for the best to even stand a chance of making it out of here alive. Bears do not give up easily when tracking scents they are interested in. The rangers once told us to hide all lotions and antibacterial soap containers that could be seen through a car window because they like them too. There are no trees here so hanging your container out of reach wont happen unless you bring in some kind of contraption in the Aniakchak National Monument Preserve. Bear Awareness Aniakchak is home to hundreds of bears. To minimize conflicts you must store food, trash, and any odorous items in bear-resistant containers (BRCs, or "bear barrels"). A limited supply of BRCs are available for temporary use, free-of-charge at the King Salmon Visitor Center so take advantage of them. Hanging food is not encouraged as trees of appropriate height will not be available in what is essentially treeless tundra. The bears will just tear them down. Rafting The Big Aniakchak River is not advised except under the heaviest financed and outside supported conditions in the very best of predicted weather conditions. This park has severe, life-threatening conditions every year. Extremely violent winds here often shred tents, scatter belongings and leave campers huddling in the open, preventing air rescue. 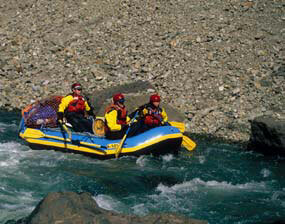 Image shows rafters floating through rocks the size of vans. They are trying to make it all the way to the Pacific ocean. A dry suit is used here. It is a thick waterproof plastic type of material that you put on over your clothes like a raincoat. You stay warm because it traps in your body heat but be prepared to sweat all day long and a bath will be very cold but highly needed. Congress named the Aniakchak a national wild river in 1980. You can float from inside a volcano to the ocean, past examples of wildlife and geology unmatched anywhere outside Alaska. The river moves swiftly through the initial narrow gorges in the caldera walls, and large rocks call for some serious boatmanship. A drop of 75 feet per mile means the water is moving fast and hard. At the end the bears and other mammals give way to seals, sea otters, bald eagles, and ocean birds living in the Aniakchak Bay. If you float the entire 27 mile long river through the entire Aniakchak National Monument Preserve it will take you about 4 days if nothing goes wrong. There is truly spectacular scenery here and for many they will never experience an equivalent adventure. The last 12 miles from Surprise lake are calmer water peacefully winding through the Alaskan tundra and down to the Gates. Wildlife is everywhere here. You will patch your raft before you complete this trip. You can camp on sandy gravel beaches where there are less insects right near the water. Use a waterproofed portable stove to cook on because there is very little dry wood here if any at all. Giardia and Cryptosporidium are protozoa found in unfiltered water and present serious health risks. Take one or more of the following precautions before drinking water from a natural source: Boil for 1 minute. Use a water filter. Treat with iodine tablets. Many of Denali's rivers carry glacial silt. This silt will quickly clog any water filter. Caribou are abundant throughout Alaska. 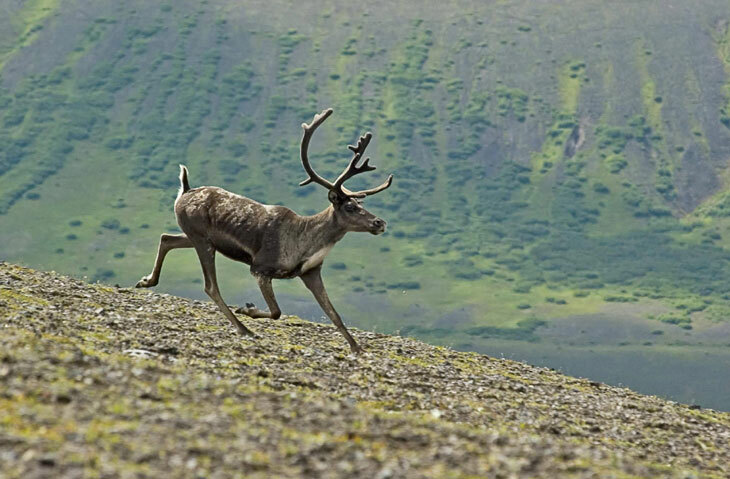 They roam freely throughout the Aniakchak National Monument Preserve area and are known to visit or inhabit the caldera. Vanabode Special Notes: Though Alaska can be extraordinary, and Vanabode offers the absolute safest, easiest, cheapest and fastest way to get there, I still cannot recommend this destination. It is wild, rugged, and the inclement weather can be devastating. If you do travel during the very warmest months please do some heavy research and planning so that your van is outfitted for Alaska's extreme temperature swings, rain and bugs among Alaska park activities.